Home > Personalization / Add-ons > Books > Non-Fiction > Relationship > Are You Made For Each Other? Put your partner to the test and find out just how well you know one another. After more than thirty years of research into how relationships work and where they often go wrong, Allan and Barbara Pease devised this clever quiz book to help you determine how compatible you and your partner are. The special quizzes, to be taken by yourself and with your partner, will help you clear up common misunderstandings and communicate better. 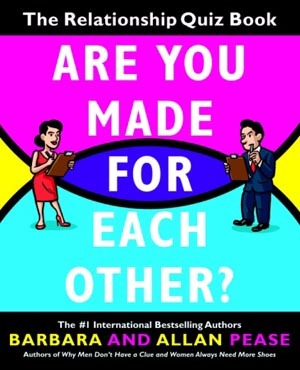 A unique blend of in-depth research, witty insight into human nature, and humor, Are You Made For Each Other? will help your relationship--and make you laugh as you learn.